So Chief Justice John Roberts, who hears emergency appeals from the state of North Carolina, split the baby on the Republicans' attempt to turn back the special master's redrawing of nine NC House and Senate districts. Roberts decided those redrawn districts for Wake and Mecklenburg counties can't be used in 2018 -- with candidate filing for office less than a week off. I've been trying to keep up with new Democratic candidates announcing across the state, and I've tried to identify where their districts are, but that's becoming increasingly difficult, and I never trust the map that Google coughs up. 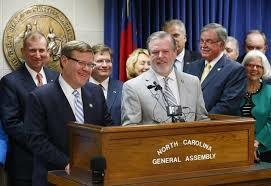 Phil Berger and His Boys, and Tim Moore and His Boys, have done one hell of a job at rolling North Carolina up into a giant tar ball of attempted election meddling and power-grabbing. They'll blame Democrats for the mess: "They should never have challenged our imperial will in court!" We know who's to blame for the shitstorm, and I think the voters of North Carolina will not reward them for their maliciousness.